In today’s fast pace, over-marketed sports world, sometimes we forget about the true importance of the sport we like to call basketball. In a little known small town, Winona Lake in Indiana, the Division III, Grace College Lancers take the floor each basketball season with undersized, non-highly recruited players. In fact, they don’t even grant athletic scholarships. 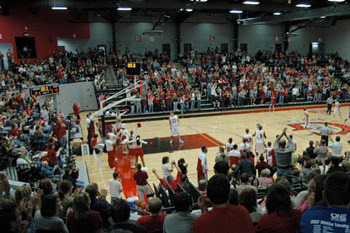 But that doesn’t take away the passion for basketball portrayed by the players of Grace College, and the student body of approximately 1,300. They are there to see basketball. Not superstars. Not superegos. I visited this amazing institution this summer, and was truly moved. Aside from the beautiful campus, and thoughtful faculty, you can’t help but channeled Jimmy Chitwood, when you step into their new Sports Arena, the Orthopedic Capital Center. Thanks for the nice compliment on Grace College sports. One slight correction, the college does give out athletic scholarships. In addition to giving athletic scholarships, we are also Division II NAIA (not Division III as stated). Thanks for the great article.